We’re a full service printing business that’s just around the corner! Located on Newman Street (W1 London), First Colour is well situated to serve the many restaurants, shops, hotels and other businesses in the bustling Soho area. From printed flyers, leaflets and menus to beautifully bound reports, graphic design and corporate stationery; our print shop is ready to serve you. Specialising in quick turnaround jobs complete with free delivery, we offer a 100% product quality guarantee to all customers. We work with a wide variety of customers in Soho, from restaurants, bars and clubs to shops, hotels, offices and other businesses. We offer a one-stop shop for all things print, design and copy! Marketing & Media Businesses - document printing, copying and binding are popular services, especially for advertising and marketing agencies looking to make an impression with their next pitch. Restaurants – printed marketing collateral and invitations for new restaurant openings and menu design and printing etc. Bars and clubs – bar/club promo including flyers, postcards and bar menu refreshes etc. Shops – posters, flyers, promotional in-store signage and business cards. Hotels – promotional material and in-room info e.g. hotel service information booklets, menus and business cards. Stay local with your printing! If you’re looking to stay local with your printing, get in touch today to request a quote or place an order. Give us a call on 020 7636 2571 or email us at westend@firstcolour.com. A member of our team will be in touch ASAP to discuss your requirements. Prefer to pop by in person? 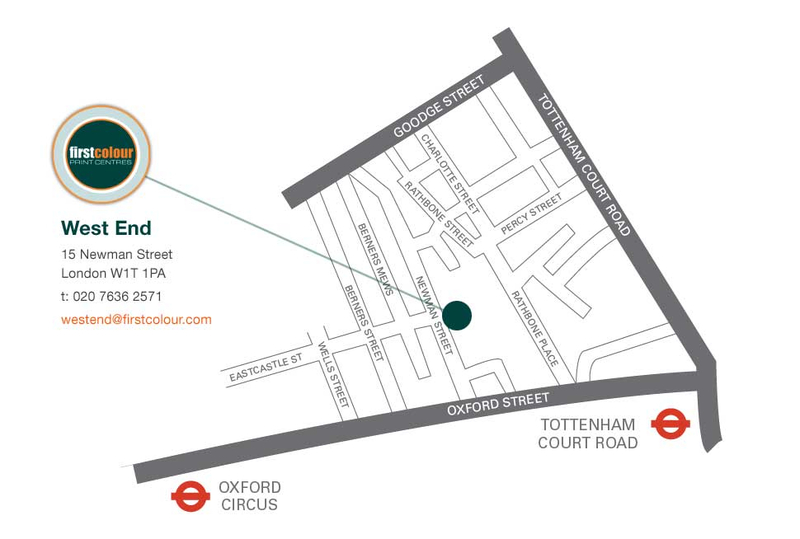 Visit us at 15 Newman Street, W1T 1PA and say hello!